It's all fun and games until someone ends up going to court. Paddy Power, the betting brand infamous for its creative ambush tactics, is at it again with this billboard strategically placed in rail stations around London. 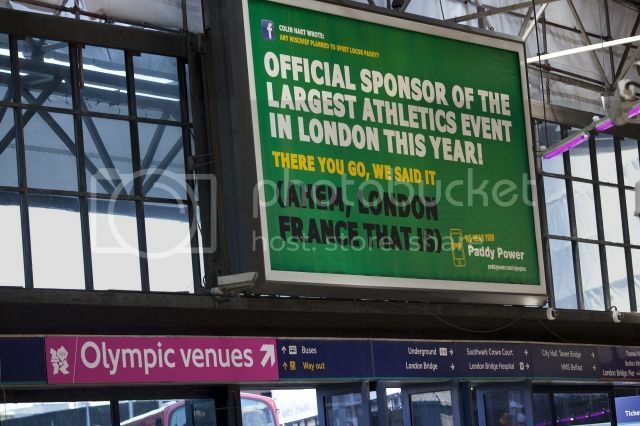 The billboard, Paddy Power says, references the Paddy Power Egg-and-Spoon Race, not the Olympics. Here's the billboard in question..
LOCOG isn't laughing and has instructed outdoor advertising company JCDecaux to remove the signage. In turn, Paddy Power has threatened to legal action.